£25 Foot Health Appointment. Janine is offering a new patient or follow-up Foot Health appointment for £25 in December. Give your feet a treat and book in with Janine by calling the clinic on 01293 542245, or you can book via our website or the Bridgeham app. NEW Garuda Barre class – Jo is excited to be running a new Garuda Barre class on Friday mornings at 9.30am. The class will lengthen and strengthen you, challenge and motivate you to want to find spaces within your body you never knew you had! There will be a maximum of 10 in the class. Cost 7 weeks for £84 6 weeks for £72 OR buy both courses for £145. Signing up to this class guarantees your place for the whole course. Class passes cannot be used for these classes. Sorry, but this class is not for Beginners. Reserve your place now by calling us on 01293 542245. Full payment will need to be made by the 14th of December. Many of you will know Janine, one of our lovely receptionists, and may already know that she has sadly decided to hang up her headphones in order to concentrate on her Foot Health clinic. We wish her all the best with this and please do book in with her when your feet need some tlc. See details above of her special offer in December. This will be the first of four seasonal adjustment wellbeing days run by Selena, our acupuncturist and Emma, our Yoga instructor. This full day workshop will include yoga, acupuncture/ acupressure, Ayurveda, Chinese Medicine and much more. The cost of the workshop will be £60 per person and places are limited to 12. Early bird discount – if you can book by the 14th of December you will receive a 10% discount. Enjoy an autumn stroll. Be aware that walking on slippery ground tightens the hip flexor muscles, which could compress your back. A simple solution – after the walk stretch your hip flexors by putting one leg behind the other and scooping your pelvis forwards (see photo above). Raking the leaves – when you have raked your leaves and are picking them up just make sure you bend your knees, keep your back straight, start breathing out before you actually lift, and that will help you keep hold of your conkers! Wheelbarrows – Set the wheelbarrow in the direction you want to go before you fill it. This saves your back from awkward twisting when it is heavy. Moving outdoor plant pots – please take care because these can stick to the patio/decking/lawn and become much heavier to move than you think. Test the pot by trying to move it with your leg first to see that it is not stuck. We see lots of patients who haven’t followed this advice! Are you struggling with ideas of what to buy your family and friends? Perhaps we can help by suggesting a Bridgeham gift voucher – the gift of wellbeing. 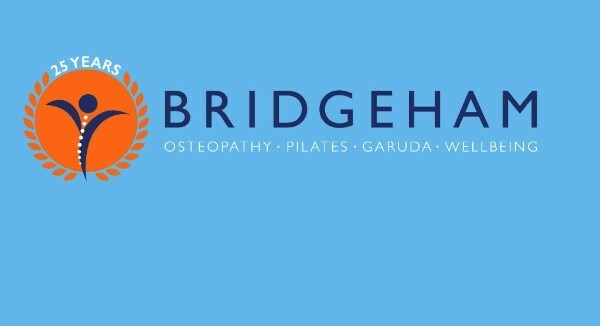 We can do a voucher for any price which can be used for something specific, or can be towards any treatment or service offered at Bridgeham. Perhaps a massage or a Pilates 1:1. For someone in your life who already enjoys the benefit of Pilates, how about a foam roller, a set of spikey balls, or a combination pack? We can even advise on how to wrap them! Congratulations to this months’ testimonial winner, Mr. P.